My drink making, much like my cooking, relies mostly on me throwing a bunch of things together, crossing my fingers and hoping everything turns out ok. Seems to work…at least most of the time. Thankfully, this attempt for Rosé Sangria worked out spectacularly! So, with our further delay–here’s the recipe! 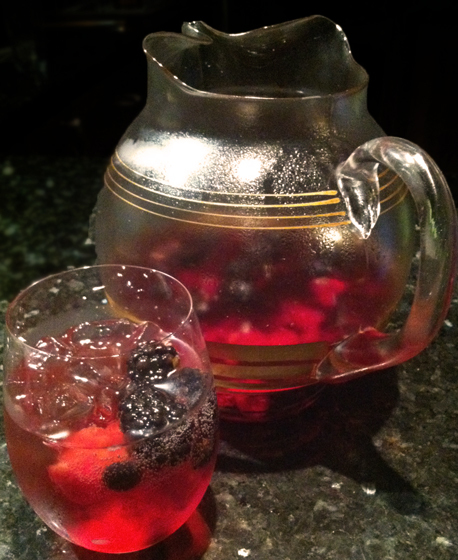 Throw all your berries in a pretty pitcher, top with sugar, Cointreau & Kirsch. Let the booze & berries “marinate” for at least an hour or more–the longer the better! After the desired amount of marination (is “marination” a word?? Sounds weird, and I don’t really feel like looking it up. Hmmm…whatever…) crack open you Rosés, and add it to the pitcher. Give it a quick stir, and you’re ready to go! To serve; fill a glass with ice, pour in some Sangria (don’t forget to scoop out some of those berries and add them to your glass,) top with a splash of club soda or seltzer, and ta-daaa — Berry Pink Sangria; a party in your glass! It pays to get involved…comment on our blog for a chance to win an Andover Liquors Gift Certificate! In order to be considered in our contest, the “rules” are simple. Pick a post, leave us your thoughts and sign your first and last name. It’s that easy…and you could win a $50 gift card, too! Very nice recipe and pretty, too! I have been experimenting with sangria for the past couple of years and have lots of various twists – will add this one…thanks for the great idea! Thanks for commenting! It seemed like the perfect combination…and it worked out well too. Enjoy!